As drummers, protecting our hearing is imperative! But one of my favourite things to do when practising is to play along to music. What’s the best way to listen to music while playing drums? Grabbing the best damn pair of headphones you can afford of course! Now, I should start by saying that this post will look at isolation headphones in particular. I’ll explain in detail what these are a little later on. Okay, with that out-of-the-way, let’s cover what you should look for when shopping for drumming headphones. 2 What to look for? 3 Best Headphones for Drummers: 3 options for everyone! Best option for most people! This is the number one most important factor in my opinion. How much the headphones isolate outside noise (i.e. your drum kit) will prevent you from having to crank up the volume too loud. Well, simply put, these headphones work by physically blocking sound from reaching your ear. They do this by forming a right seal around or over your ears so less sound reaches your eardrums. 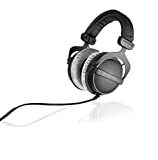 The alternative to these types of headphones are noise cancelling headphones or in ear monitors. Further reading: If you’re looking IEMs, here are my top picks for in-ear monitors. Noise cancelling headphones use a microphone to ‘listen’ to outside noise and actively cancels the sound it ‘hears’. They’re usually more expensive because they require more technology. It’s worth remembering they also require batteries, which means charging which… meh, a hassle. Comfort is a big thing for all of us. You’ve likely spent ages perfecting your kit’s setup, cymbal angles, throne height etc. to make sure you can practise and play for hours on end. You’re going to need headphones you can use for just as long! Now even though you’re reading a guide on the internet, I’ve asked friends, trawled through online reviews and used my personal experience to give you the best guide on comfort that I can! We’re looking for soft ear-cups that don’t squeeze too tight AND keep the noise out. Usually it’s either going to be a 1/4″ or a headphone jack connection. The main thing to look out for is whether they include an adapter to switch between the two! Best Headphones for Drummers: 3 options for everyone! The KAT KTUI26 is known for being the best value drumming headphones out there. They come with a 6 foot cord to give you plenty of length to play with and include an adapter to switch between input types. Even though drums are loud, some people say the isolation is so strong that you might have to leave a little bit of a crack so you can hear what you’re playing! With these headphones being cheaper than popular brands, the sound quality isn’t the best… but all in all, they are a great choice for the budget end of the scale. I’ve used and seen the beyerdynamic as a STAPLE in recording studios. The comfort of these headphones is amazing, the cups are incredibly soft and headband sits nicely on your head. Plus, you can even replace the headband if it gets worn out! The isolation of these headphones isn’t as extreme as the KAT’s so these are perfect for when you need to hear a bit more of your environment than usual. Now, these headphones are the ones I see everywhere in drum rooms. Mainly because they were the first created specifically for drummers by a drum brand. These headphones are popular for a reason. The sound is good, however, the real reason you want these is for the isolation they provide. Keep in mind that to get good isolation, they have to fit your head very tightly, so these might be a bit too tight for some people. The main issue with the sound (I found this to my main bug bear on the V1s too) is that the sound lacks bass. If you’re going to use these purely in the studio to get the best monitor mix sound… go for it. If not, I’d choose something else! There you have it, I’ve kept the list fairly short, to cover the main types of headphones that drummers will need. Have I missed one? Get in touch and let me know!